Today we’re in Berlin to cover Huawei’s launch of the new MateBook series. 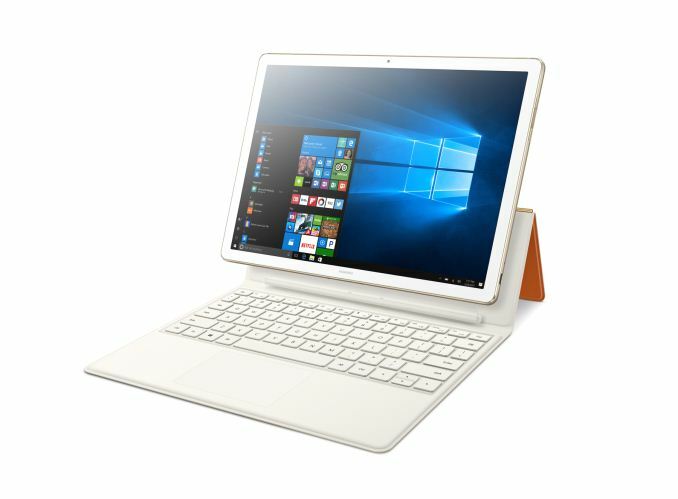 For this second generation, Huawei has on offer a 13-inch clamshell aimed at premium users, a 15.6-inch device for education and office use, and their next generation 2-in-1 called the MateBook E, aimed squarely at improving the design on their first attempt back in 2016. Perhaps somewhat ironically, because I left my main laptop charger at home, I’m writing this news on that 2016 model which I carry as my backup work device. The MateBook E: Surface Says Whaaaaat? 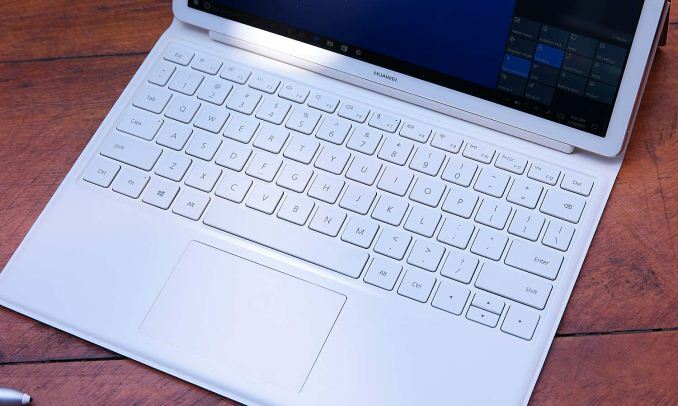 When Huawei launched the 2016 MateBook, for a first attempt, it hit the market where it needed to. Much like other vendors when making their 2-in-1s, there was some design choices that seemed a little strange but Huawei had at least nailed the quintessential Huawei look, transferring the design ID from their top of the line Mate series smartphones, into a portable PC device. It was also Huawei’s first venture using Intel CPUs in a consumer device. What the MateBook E does, as the second-generation product, is fix those questionable points and bring everything up to the latest hardware. That means using the latest Kaby Lake-Y processors, adjusting what configurations sold the best, and giving a keyboard and hinge that users actually want. It’s a good step up from the 2016 MateBook for sure. At the heart of the MateBook E is Kaby Lake Y, the 4.5W processors from Intel. Along with Intel’s new naming scheme, here the MateBook E gets either the Core m3-7Y30 or the Core i5-7Y54, matching the similar CPUs to the last gen but on the latest microarchitecture using updated features like Speed Shift 2. These processors come with Intel’s HD 615 graphics, and will be supplied with either 4GB or 8GB of LPDDR3 and then 128GB, 256GB or 512GB of PCIe storage. As with the MateBook 2016, this isn’t expandable. Aside from the processor update, the biggest change is in the keyboard folio. The keyboard folio now comes with the device rather than being an add-on, and the hinge is updated to allow for a full 160 degree of tilt. 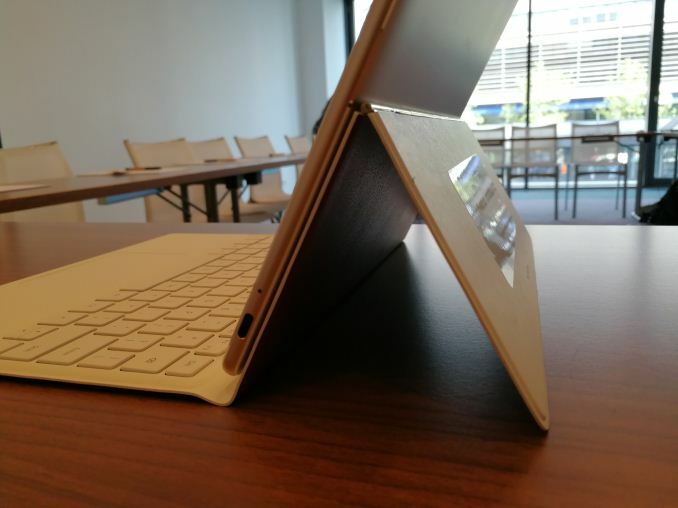 Unlike the Surface which integrates the hinge into the device, the hinge is part of the folio, and stays with the keyboard but aligns flush when not in use. The hinge mechanism isn’t anything special like we’ve seen with fancy designs before, but with a few minutes use it was clear that the design was sturdy for what it needed to be. 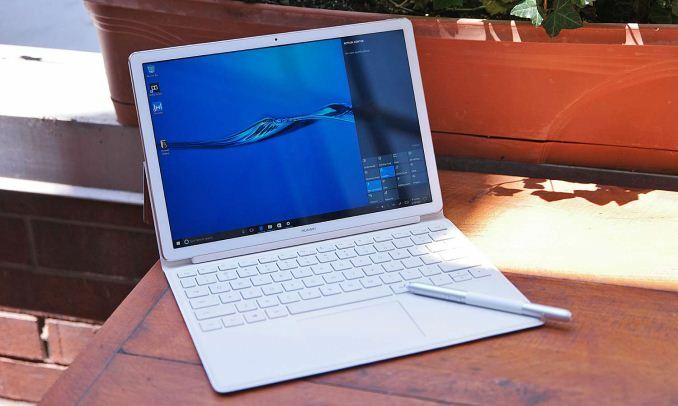 The folio uses a new 3-pin connector to the MateBook E, rather than the 7-pin used in the older device (which means no backwards compatibility), and the keyboard has now changed into a spill-resistant chiclet design. I spent a few minutes with the new keyboard, and due to the reduced key travel compared to the older model, it felt a little different and perhaps not as free flowing. It will be interesting to see what others think about it. The folio no longer goes all around the device, which means the power button should hopefully no longer be accidentally activated when closing the folio. Along with the power button is the fingerprint reader, carrying over from the 2016 model, as well as a single Type-C connector. This is used for power as well as connecting to the new MateDock 2, which also comes bundled with the MateBook E in some regions. As with the MateBook X, the MateDock 2 is updated this year as well: it exchanges the ethernet port for an HDMI output and a VGA output, making the device thinner and arguably more applicable to presentational style workflows. The new MateBook E is thinner, coming in at 6.9mm, and houses a 33.7 Wh battery (up from 32.7 Wh) which Huawei claims is good for 9 hours of video playback at 50% brightness. The speaker system is carried over from the 2016 model too, although with Dolby Audio Premium certification. Huawei is announcing availability and pricing at the official launch event today, and we’ll update this piece when we get the details. Colors for the MateBook E will be region dependent, but you’ll see at least one of Titanium Grey (with Blue folio) of Champagne Gold (with a Brown Leather folio or a Pink folio). Some pictures were provided in collaboration with other Purch outlets.